This large canvas of about 1670 is Ruisdael’s most ambitious view of grain fields, a subject he treated frequently. The monumental design, with its centralized recession into space, might have been intended for a particular location, perhaps above a mantelpiece. During the seventeenth century, paintings of this size were usually hung high. 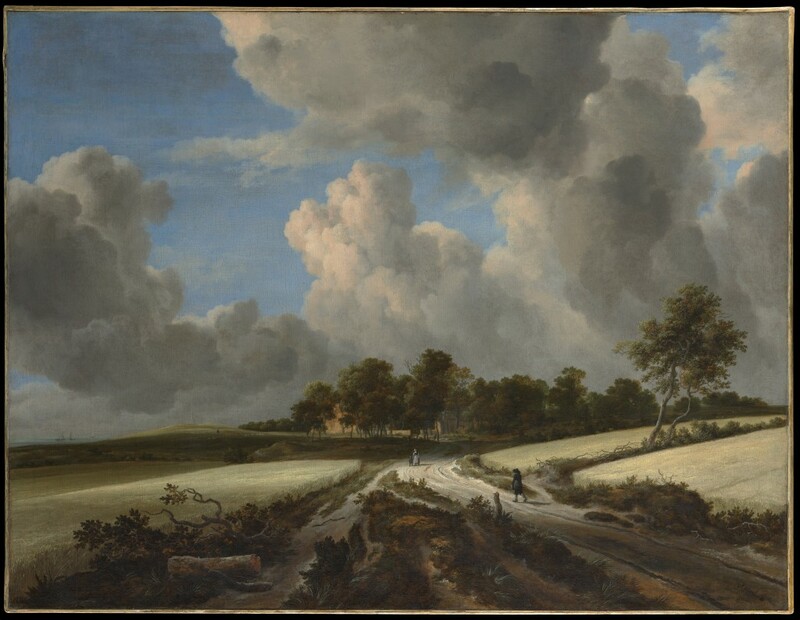 This work is generally considered to be the “most imposing treatment of the subject” among Van Ruisdael’s twenty-seven known views of various grainfields. Rosenberg and Slive, the two leading authorities on the artist’s work, concur in dating the picture to about 1670. The sweeping space flows directly away from the viewer, who is drawn into the landscape by the rapid recession of a sandy road. Despite the composition’s obvious structure, it conveys the natural sensation of walking in the Dutch contryside, with its lasting impression of terrain extending in all directions under an endless sky. As might be expected, the painting is comparable in design and motifs to a few other views of grainfields by the artist. However, the composition stands apart to an extent that leads to speculation about the work’s original placement. In its size, proportions, and centralized design, it would have served well as a schoorsteenstuk (chimneypiece) above a mantel in a Dutch house. The first recorded owner of this canvas is Pierre-Louis-Jean-Baptiste Colbert, marquis de Laplace, who probably acquired it after having served at the French embassies in Washington (1864) and St. Petersburg (1866). In the 1880s and 1890s, while he had various roles in the French government, Colbert also worked for the interests of agriculture and distilleries. Benjamin Altman acquired the work in 1909. 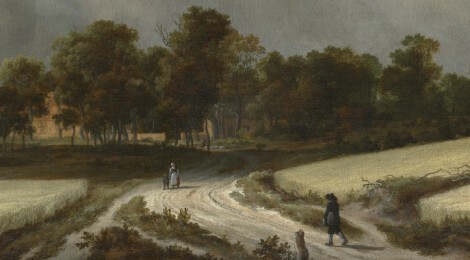 The three Dutch landscapists most admired by Gilded Age collectors in America were Van Ruisdael, Hobbema, and Aelbert Cuyp. Altman owned works by all three (MMA 14.40.614 and 14.40.616); his homage to them could hardly have been improved.